Patients with tooth loss have a variety of options available to them when it comes to restoring the smile. Dr. Scott Stewart of South Lakewood Dental in Colorado may suggest full dentures for patients who need to restore all their teeth. However, traditional full dentures, on their own, may be ill-fitted and difficult to keep in place. 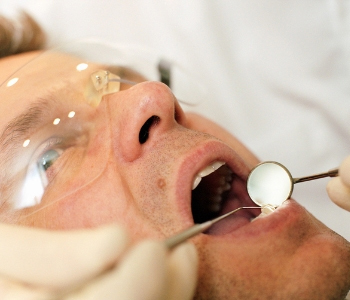 This is when alternatives such as implant-supported dentures may be recommended by his team. Traditional dentures use natural suction or dental adhesives to keep them in place on the gum line. Unfortunately, this sometimes does not work properly for some individuals. Patients may have difficulty keeping their dentures in their smile and may be self-conscious when they socialize or eat their favorite foods. They may constantly worry about their dentures falling out at the most inopportune and embarrassing moment. Instead, these patients may find that implant-supported dentures are a viable option for them. Implant-supported dentures are dentures that snap into place with dental implants, placed strategically along the gum line, that can provide amazing stability and strength that a patient otherwise would be unable to achieve. Who is a candidate for implant-supported dentures? The most appropriate method of determining candidacy is by scheduling a consultation appointment and initial examination with the team at South Lakewood Dental. Ready to discuss implant retained dentures with a professional? Call (855) 233-0023 to speak to Dr. Scott Stewart at South Lakewood Dental to speak about the advantages of retaining a full denture with dental implants. His practice is located at 2525 S. Wadsworth Boulevard, Suite 1 and welcomes new and existing patients to make an appointment. He is dedicated to providing biological dental care to patients in and around the community of Lakewood, Colorado.